Democrats are trying to prove they can walk and chew gum at the same time. Seems like a rudimentary task but realize how challenged they are. Messaging from the left often includes orange skin, overweight diet soda drinker, small handed and illiterate. In response, Trump is literally eating their lunch and carrying off the Republican agenda masterfully. The focus for conservatives is simple, appeal to the base and grow it through generating wealth within the corporate sector and pack the courts. This is really a simple plan but the democrats are making it even easier with a dedication to Russia Gate. Russian interference in elections is such a difficult task to prove and obviously Trump did not collude in any way. If democrats really cared about external influences on our elections, they would have denounced the PM of Israel, Netanyahu addressing our congress behind back of our sitting president (speech without Obama’s invitation / permission) and challenging policies in person. Netenhau’s speech to congress and campaign funding has a larger influence on elections than anything Russia accomplished. Democrats have invested everything on the premise that Trump colluded / obstructed justice while dismissing fundamental policy important the their constitutes. Trump realizes how important his base is and democrats do not. Trump knows where his support is. Grow extreme wealth with a tax bill, appeal to southern voters with 2nd amendment and NRA issues, Northern Evangelicals see Roe V Wade getting challenged, show strength toward protecting our borders and generate an economy which favors all. If you share in any of these beliefs, Trump is your leader. One could surmise democrats are paving the way for a second Trump term. There is no message from the democrats and they realize it so they are grasping at anything that will generate publicity in a crowded field. As a result, the democrats are all resorting to giving things away for votes. In polar contrast to being accountable, democrats run on eliminating college loans, reparations to slave descendants, single payer health, higher min wage, family leave, sanctuary cities, reinstate felon voting rights and of coarse completely open immigration policies (future democrat voting pool). If you are sick of relentless politically inspired investigations and a drive to enhance the welfare state, then you would Rather Be Right and MAGA. The investigations and false allegations should stop but it is Trump’s good fortune the democrats do not have much legitimate political opposition so the witch hunt continues. Be vigilant, the 2020 victory is certain. We waited with great anticipation for the Barr presser followed by the release of the redacted Mueller report. There was a good idea of what was in the 400 plus pages and within a few hours the report once again vindicated Trump of collusion What is troubling is the amount of flunky legal analysts and mainstream hosts that make a living on the fact that Donald Trump did not collude with Russia during the 2016 campaign. Headlines were only to happy to represent the adolescent ‘FU***D’ or ‘does not exonerate’ or ‘cover up’ or ‘I do not recall’ or my favorite ‘ ‘NOT A CRIME BUT……..” . Since collusion did not occur and everyone is agreeance of that fact, the left media must now direct their attention to obstruction , anything else they can hang on our president. For over two years Trump has been saying there is no collusion and the investigation is a witch hunt. The actions that surround the democrats desire to prove obstruction are those of a man that knows he is unjustly targeted for something he did not do. The corrupt intent and lies that the democrats want to prove are secondary to the fact Trump did not commit collusion with Russia. Trump knew from the onset of the investigation that it was unjustified and a deliberate attempt to dismantle his presidency. How can you obstruct an investigation that was intended to undermine the credibility of our president without validity? Democrats are now concerned about lies and obstruction - how many democrats went on national TV and mentioned they knew or had proof of collusion? Didn’t democrats obstruct the investigation by stating facts that were specifically false? Now democrats hide under the cloak of ‘oversight’ and do not provide the same apologies that they demand come for our president. Further, democrats now see any form of indictments or impeachment not plausible so they wish to shoot the messenger and focus on the words of Barr and Sanders. Now its Barr and Sanders that is not credible and carry a tarnished record moving forward. With that form of thought, how credible is Adam Schiff, who has plenty of proof of what does not exist? The intent of the investigation was to determine if Trump colluded with the Russians during the 2016 election. Mueller determined there was insufficient evidence for the initial investigations intent. Since obstruction was actually served back to congress through the AG, it is to only thing democrats have to arm themselves with to hunt Trump. We are definitely in the throws of the 2020 campaign and democrats have no pitching. Barr finished his second day on the hill and left the never Trumpers in complete disarray. Pelosi. Schiff, Nadler, Neil etc are ‘deeply disturbed’ by the AG’s performance. I share a polar opposite viewpoint and applaud Barr’s performance for supporting Trump. These bloodthirsty democrats are truly adolescent in their dismal attempt to bring down our president. The left has no vision and lost sight of true leadership which will be obvious when Trump wins his second term. While Trump packs the courts with judges, builds our southern border and grows our economy, the democrats focus on: hush money payments, Trumps taxes, campaign finance crimes, security clearances, Mar A Lago security and the Mueller report. The democrats are not serious about American prosperity as long as they continue to focus on the demise of Trump. This is a witch hunt that does not look healthy on the surface. News outlets featuring left propaganda actually count Trumps days in office while hoping for a change in leadership on January 20th 2021. I was raised with the directive to earn leadership not to hope for it, but I was raised in a Republican home. Trump is focused on a Making America Great Again. Stay vigilant while they fight within their own communities!! Don’t want to pick on Booker’s town hall yesterday to much because it was just as pathetic as Elizabeth Warren’ recent town hall. The questions asked are adolescent and minimal in scope to the country as a whole but very important to the welfare state. All questions stem from what would the candidate do to enhance my pathetic life because I have not performed adequately nor taken advantage of policies in place and need more. What are you going to do to ensure my retirement and social security, What will you do to ensure I get paid more per hour, What are you going to do to reduce my school debt, What are you going to do about my exorbitant child care costs – get the idea and understand why democrats feel the need to do EVERYTHING for their supporters. Don Lemon continued with the adolescent questions with one pertaining to the obsession of impeaching Donald Trump. Followed by another question regarding the highly publicized Jussie Smollett case in Chicago. This town hall was tabloid hour on steroids. Not sure what was worse, the line of questioning Don Lemon thought was important for a Presidential candidate or how the presidential candidate answered the questions. I feel the need to expand on the unfortunate situation in Chicago and Jussie Smollett. In the future, please watch EVERY democratic candidate respond to this case in the same way!!! They will spin from Jussie Smollett and go directly to the rise in hate crimes associated to white supremacist. Neo Nazi groups causing so much trouble, etc. etc. etc. One thing that was not mentioned was the 100% increase of gay black actors being criminally charged with lying to police about being brutality beaten by fictious MAGA hat wearing racist thugs carrying an extra noose and bleach screaming homophobic slurs. Many people believe, there are individuals walking the streets late at night doing these horrific acts. When will this madness end? Its these small details that seem to escape democrat’s minds. While these are the topics of choice at democratic town halls, the relentless and demeaning aggression toward President Trump continues. Trump is constantly described as an ignorant minimalist that does not read and does not know anything about governing. Who was the last president that maintained constructive talks with China re: real American problems associated with trade? Scope and specifics are finally being addressed concerning forced technology transfer, cyber theft, intellectual property rights, services, currency, agriculture and barriers to trade. These are TRUE problematic issues that plague international business between China and the west and the Trump administration is making significant strides in this arena. Do you think Lemon would want to trouble himself with any difficult topics that matter for everyone in America (international commerce) or does he have a hidden agenda to discuss certain communities? If small and local topics are discussed on National stage, then only small and local progress will be made. Don there are bigger things in life than HCBU’s. The one Belt One Road is an infrastructure development strategy being devised by China and most consider it a very significant economic plan (some say brilliant). World trade and International business will be making enormous advances by 2025 and I am glad we have Trump at the helm looking out for all Americans. As Americans we need to challenge ourselves and develop constructive / dynamic thought initiatives for future growth on a global stage. The dumbing down of our society and not addressing the really critical topics will challenge our position as a world leader. It’s not what your democratic candidate can do for you, it’s what can you do for yourself. 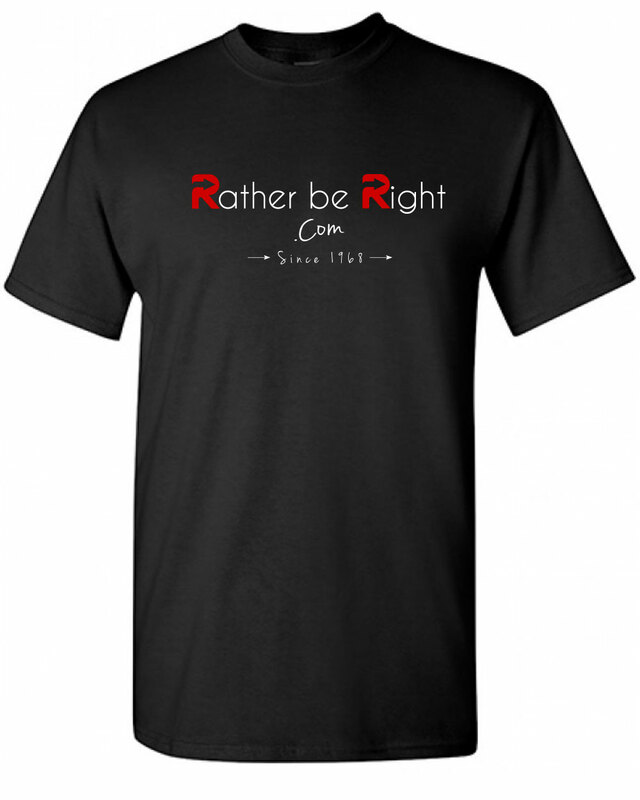 Everyone would Rather Be Right – it just takes a bit more effort. I watched Booker’s Town Hall moderated by CNN’s Don Lemon Wednesday night. Booker was able to knock the softballs out of the park thus maintaining his dismal performance as a presidential candidate. This could have been an opportunity to make a significant impact for his otherwise mediocre campaign. Booker is a ‘mid pack’ candidate without much going for him. His lack of strength and message of love and unity will not Trump much. Booker, similar to all the democratic candidates, stand strong on issues that requires giving away the farm. Lets be extremely clear, although the primary point of motivation for democratic candidates is to remove Trump, the lack of policy ingenuity is their second commonly shared thread. Watching Booker cave on every topic reaffirmed my belief Trump will be victorious in 2020. My cliff note version of Booker being a problematic president include these political viewpoints. College debt: Generations have been saddled with this debt and have been able to get personal responsibilities under control. Individuals that benefit immensely from obtaining a college education should realize that the temporary strain of repayment is a sound investment. Booker wants the government to assume personal student debt. Those that need help with their lack of personal management of finances agree with Booker. Health Care: Everybody should have healthcare under a single payer situation which will again free up individual responsibility. Why would anyone want to get health care from the private sector when the government can give that to you as well. I (JDUB) am curious why democrats have stopped at 26 years old to coattail parents policies when they should have taken this all the way to 65 when the government pays for retirement. These additional years would definitely help reduce unfortunate stress. Every child will get $2000 at birth – Although this program is designed to help everyone, the program is massaged by the government to provide those that are deemed marginalized to benefit by additional practices. Goal is to have everyone compile approx. $50K by graduation from free college. Reparations – Did not provide much detail on this drastically needed payment to African Americans who are descendants of slaves. My question is; will a Booker administration take a through look into all the programs and policies that have been devised in recent years specifically to assist those in our country who are undervalued, underestimated and marginalized? A left leaning government knows additional handouts and liberal policy will maintain and grow the dependent state. Everyone can see that democrats want to reduce individual responsibility by providing everything from housing, food, college education, child care, health care, higher minimum wage and now reparations on the backs of the conservative minded. It gets better, in addition to providing ‘essentials’, democrats want to expand the dependent sector by reinstating felon voting privileges, eliminating borders for caravans and reduce progress for deporting those in America illegally. The thought of democrats demanding conservatives pay exuberant taxes to promote a welfare state is unconscionable. If you would Rather be Right, support the president that supports you. Support President Trump. Be Best & Make America Great Again!!! Political payback will be interesting to watch in the near future and going deep into the 2020 campaign. We are watching the implosion of the democratic party in slow motion. Trump is just beginning the I told you so tour so grab a huge bucket of popcorn and enjoy. The current exuberance on the Right is justified by two years of misleading democratic officials pretending to work under the disguise of ‘working for the people’. The lefts hatred for Trump is so intense and their investment in ending Trumps presidency is paramount to properly leading their constituents. The 2020 campaign is in full motion and democratic candidates are not fielding many questions about the Trump / Russia connection. Clearly the DNC is setting themselves up for another season of constituent disapproval by focusing on irrelevant topics. It would behoove democrats to lick their wounds, admit their assumptions were delusional and cease the overwhelming negative assaults. Since we know they are not capable of these common sense recommendations, don’t be surprised when they focus on ‘not exonerated’ – ‘obstruction’ – ‘full Mueller report’ and ‘cover-up’. When you combine The Green New Deal and the obsession to impeach Trump, the result is THE complete democratic message. The game plan for the DNC is obviously problematic and will result in a gift to Trump. The agenda for the Right is completely different because there are no signs of desperation. Trump is in a sweet spot because he can continue to govern, make effective policy for conservatives, gloat on the inept practices of the DNC, build the wall, convert the independent vote, enhance our military, dismantle the affordable care act, stack the courts, eliminate the welfare state, continue growing manufacturing jobs, win win win and Make America Great Again! During all the success that Trump is generating, the democrats will lead their constituents from behind the mantra of oversight. It must be really exciting to be a democrat or socialist when your future is entirely based on the success or failure of others. If you can not pave a path of success for yourself, become a democrat and complain about the achievements of those that perform. It is apparent democrats have animosity toward our highly skilled president and in exchange for developing any policy, they focus on removing Trump at any cost. Example – you’re a little league team that has a weak defense and offense and are tiered tired of watching your opponent continue to score, the only thing left to do is taking out the opposing Quarterback. I feel sorry for Trump when I witness democratic leaders desperately try to spin the narrative that he is an agent for adversarial foreign power. Stop to think how pathetic it this is when a two year investigation reveals zero illegal involvement and the response from the left is how low the bar must be for Trump. Trump has taken an illegal cheap shot from democrats and came out unscathed. I mentioned desperate because that is best description of a party unwilling to face reality. It is not patriotic to strategically position yourself for success by generating fictious innuendo. For all the Independents out there – wouldn’t you Rather be Right and make your vote stand for American progress instead of supporting a party in desperation? Enjoy winning, vote Republican. On my soapbox thumping my chest. Hail to our President Trump. If its a great night for Trump supporters, I can only imagine how satisfying today has been for Donald Trump. Rightfully so, Trump has been saying ‘No Collusion’ for over two years and it has fallen on the inept ears of the left. Tonight, Trump is following that up with ‘No Obstruction of Justice” and if you are smart, believe Trump instead of the vendetta driven DNC. We know Russia has manipulated our democracy for generations and we must now pay attention to it because Trump has business relations in Russia. What did Obama do for the last year of his presidency knowing Russia would interfere with our election process? The answer is absolutely nothing because the democrats thought the ‘deplorable one’ would win and it would not matter. Well team Trump took the blue ribbon and that has not sit well with the establishment. For two years we have listened to democrats scream and cry Russia, Russia, Russia!!!!!! Trump has colluded with Russia to steal the presidency. How much time and money was wasted because the democrats chose the wrong candidate to represent the party? Stand on any mountain top and you can not see any sight of Hillary today and she was to be the breaker of the glass ceiling. Hillary and all democrats were dumbfounded when Trump was rightfully sworn in as our 45th American President. Well now that independent council has found zero connection pertaining to Trump colluding with the Russians, the post have been moved to obstruction of justice, political corruption and abuses of power. Democrats now question the integrity of AG Barr and will request him to testify before congress. OK - the American people are fed up with the Witch Hunt. Let the DNC continue with another attempt at the all mighty. The only winner will be Trump because he will be gaining Independent Voters by the thousands!!!!! The inevitable outcome is another superior electoral college count but the democrats are crying about that as well. Come on, it is a good thing an independent council found no collusion with a foreign power. When will democrats learn to just do the Right thing and give up the smear campaign under false pretenses? Pretense - An attempt to make something that is not the case appear true. Pretense - Is this not the perfect word selection for the pathetic democratic party? The democrats narrative or false pretense will continue because they are now crying our national interest may be compromised due to a Russian Federation leverage negatively impacting American foreign policy. This to will be proven as a false and discredited allegation. Trump is deeply apologetic that our nation is going through this adolescent behavior from the left. Trump will continue working in behalf of our great nation while democrats continue to move left and promote an obsessive tirade toward an unreachable conclusion. Everyone knows Trump will not be indicted or impeached but when you have hung your hat on a lie for this long, it is hard to correct. Why would anyone be a democrat after watching the inept practices and leadership of the DNC? Personally I do not see how anyone could vote against the true political Rocky, Donald Trump. Two shout outs - I do not usually agree with Kristien Powers but I am grateful she stood up for Donald Trump tonight on Anderson Cooper re: the false accusations surrounding collusion. Second, I am sorry Tiffany Cross is not happy with the results of the Mueller investigation but; those that matter are happy with the results!! Thursday night in Michigan will be incredible and I look forward to Trump taking a bow. I hope he feels vindicated for all the unjustified turmoil he has shouldered for two years. I like being positive and I would Rather be Right so I stand with President Trump. They share the same relative age, 16 and 17 but treated so different by the main stream left media. Nicholas Sandmann is a 17 year old Junior that attends Covington Catholic HS. Sandmann was thrown into the media spotlight when he and his schoolmates attended the March for Life in Washington. Videos went viral. Initially, Sandmann was viewed and labeled by the left as a teenage instigator. This narrative was quickly squashed and proven premature. When a young man stands harmlessly still without any hostile movement or verbal exchange at all, the left must then acknowledge his ‘smirk’. That’s right, it was his smirk that was offensive. Stories mounted how Sandmann was offending and initiated confrontation with Native American Nathan Phillips and a Black Hebrew Israelite group. Videos showed this was not the case and instead fake. What was revealed in the videos was the MAGA hat Sandmann was wearing. Since Sandmann was wearing this iconic headwear, he must be offensive and racist which justified the left to wrongfully condemn and vilify the teenager. Sandmann’s recourse is now to sue media outlets for compensatory & punitive damages because his image and reputation was tarnished. The media was so enthralled by a MAGA hat that they disregarded professional and non-bias reporting practices. The left condemns anyone that supports the ‘Make America Great Again’ mantra and wrongfully associates MAGA hats with hate. Polar opposite reporting practices by the left has been awarded to the 16 year old who violently smashed an egg on the back of a Australian Senators head. This event was also captured in whole by video. To set the scene, Australian Senator, Fraser Anning was addressing the Melborne media about the massacre in New Zealand in which 50 innocent people were killed. The 16 year old took an egg and smashed it on the head of the unsuspecting Senator. In typical left wing media fashion, AM Joy acted astonished that the Senator reacted by punching the offender. That’s Right, Joy Reid was on the air Sunday morning when she dismissed the behavior of the teenager and focused on the response of the Senator hitting the originating offender in the face. Mrs. Reid, please watch any of the numerous videos about this incident and acknowledge it took five (5) men to apprehend the teenager and he was subsequently arrested. Nicholas Sandmann was not arrested but was villainized for wearing a smirk and a MAGA hat. Nicholas Sandmann stood harmlessly in front of a Native American and was shamelessly victimized. A Senator making a comment about Muslim immigration, not supported by the left, arrogantly found solace in the illegal acts of violence from a disruptive teen. The reaction form the left media towards the two teenage media sensations could not be any different. If you are innocent but represent right wing viewpoints, you are instantly labeled complacent of hate toward all minority groups. If you premediate and violently assault an individual, and your viewpoints are left in nature, illegal acts are overlooked. These two young individuals acted extremely different, unfortunately the bias media treated them extremely different as well. 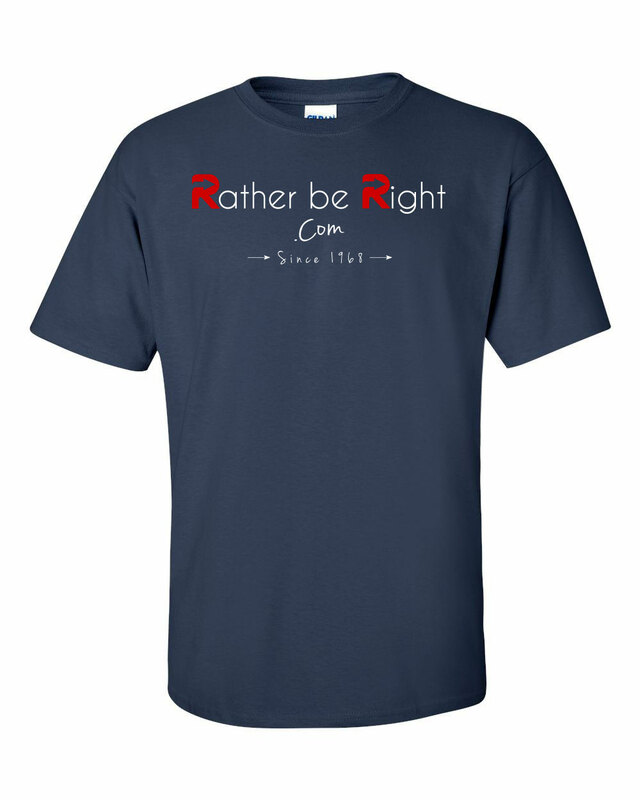 I would Rather be Right when referring to political affiliation. When Trump wins his second term in 2020 the democratic response will mimic those of 2016. We will witness a ton of tears and faces of democratic disbelief standing under a non-blemished glass ceiling. Not sure why I torture myself by watching the main stream media comics. Yesterday Don Lemon and Chris Cuomo showed us they not only lacked journalism skills but their comedian and musical talent is also deplorable. The duo tormented viewers by liking Trump to Fred Flintstone and Archie Bunker. Lemon pushed the narrative that Trump believes the ‘advancement of technology is a bad thing’ and continued by suggesting America is going back to the horse and buggy days under the leadership of Trump. Great examples of fake news because Trump’s directive to the pentagon to create our sixth branch of US military, the Space Force, is a true example of his desire for our nation to advance technically. The media mocks and generates polar opposite (fake) images of Trump then questions why they are judged as misleading journalism outlets. Mr. Lemon, please set us straight with the percentage of Americans that look like you holding highly technical careers then call me to sing the Archie Bunker intro. I am asking because I believe you bring race into a majority of your reporting. You could have reported that Trump was trying to relate to those not technically inclined, but again you went lower. Not confident about this Mr. Lemon but I believe Trumps plane is bigger than yours. The ‘bash Trump at all costs’ is hitting elevated levels (Tim Cook from Apple as Tim Apple – Really). As we get closer to the 2020 election, we will witness adolescent coverage of the Trump administration because they will let bias opinions cloud their professionalism. If we are so concerned about how we are perceived around the world and want America to achieve as much as possible, why do we make our president look bad with prime time immature coverage of our countries leadership? Trump is our commander in chief and if you disapprove of his policies or even Trump as an individual, why go to extremes to mock him and generate fake news? The love of Trump is getting stronger which is proven by the Republican voter approval ratings maintaining 90%. Left wing radio host Thom Hartman is very puzzled by this 90% approval and questions why Trumps support remains and in fact grows. Simply put, the comedic reporting by main stream is so negative toward Trump, Americans realize he does not deserve the fake coverage. If the left continues to cover the current administration with obvious distain, it will make Trump’s support become iron clad. Americans, at least the ones that vote, are able to witness the desperate reporting from the main stream. How pathetic is it when your primary message is anything but Trump? Democrats have wanted to impeach Trump for months. As a result of this meaningless assault and ‘witch hunt’, the Speaker of the House recently voiced opposition to the impeach Trump directive. This is another example of what democrats get accomplished, absolutely nothing. The hate that has consumed the left over the last two years is staunch but what were they able to deliver other than true obstruction of American progress. Paul Manafort was sentenced to 47 months. Media outlets and evening commentaries did not act like you would think, they acted worse. The reaction to Manafort’s sentence was so adolescent and yes ‘sick’ it was difficult watching adults act like complete children. I believe a major contributor to Judge Ellis’s decision was based on common sense. Prior to Trump’s election, Paul Manafort’s name was a seldom heard and far from the common water cooler discussions of today. Paul Manafort was another pawn that surfaced in a ‘trumped up’ investigation into a fictious collusion narrative. The judge went out of his way to mention Manafort’s blameless life and we should question why and how Manafort is facing charges in the first place. Manafort is guilty but he is first unfortunately guilty of being caught up in a witch hunt. Without this being spelled out in crayons for the mainstream media it is up to them to connect the dots. This will not happen because a rudimentary level of intellect is required. The mainstream feels compelled to report and even adlib to the dominant news of the day. When Manafort was sentenced, there was not even a close second story so we were subjected to commentary on steroids from the flunkeys. Even those without JD degrees knew the guidelines for Manafort’s sentencing was between 19-24 years and when the reality of 47 months was given all hell broke out. I am confident Judge Ellis delivered his sentence based on his exemplary experience and long history of service to his country. The personalities that consume a majority of the nations screens during prime time constantly resort to bottom feeding tactics. Just a few of the ignorant comments from the media and contributors included – rich guy privilege, an insulting sentence, very sad day for out country, people with Manafort’s ilk, shocked by sentence, absolute unfairness and the most arrogant commonly used accusation of inequality in sentencing based on race. If you are in search of ratings and wish to appease to the easily influenced, race comparisons is always a topic that will fill minutes, pay exorbitant salaries and give legal analysts without clients something to do. Popular networks did not stop with complaining and crying about the sentencing being far less than what prosecutors wanted, they expressed their desire for a longer sentence (and consecutive) to be given by Judge Jackson next week. How pathetic and polar opposite of true journalism. Why report news when it is far more interesting to give personal bleeding heart commentary and call it news? I believe Judge Jackson is just as professional as Judge Ellis and will not have her judgement clouded by media outlets and left wing beliefs that have a vendetta towards President Trump. Anyone associated with Trump should pay a higher price solely based on association is the true directive of left adolescence. Why state the obvious or the truth when inserting personal opinions and FAKE news draws the masses? I respect viewpoints that would Rather be Right. In typical demonstrative fashion, Hillary announced she will NOT be running for the highest office in the land in 2020 and who wins….. the entire village. Not sure what happened but a bulb went off within her mind and she realized how pathetic of a candidate she was and would be. Look how large the Democratic field of ‘want a bees’ is and growing every day. In a year that almost anyone with a pulse believes they can lead our country, Hilary has decided to cry from the sidelines instead of behind a podium. She has vowed to torment us with her words of wisdom and angry theatrics. There is a silver lining to this news and we will all benefit when her exposure is reduced to levels deserved by someone that did not scratch the glass ceiling yet alone break anything but email servers. Actually giddy today knowing we will not be subjected to deplorable behavior like cheating at debates or lying about front runner status of a rigged system. While closing the door on the ‘I’m With Her’ failure we celebrate the sequel being submerged in bleach. What will the democrat party surprise us with this year? Who will they decide should represent them? We may be deplorable but not scared of a party that has a recent history of poor judgement predicting winners. She looks angry and hysterical when she speaks. Violently screaming about fictious crisis which are intended to bolster the empty thought processes of followers blaming all their problems on ‘isms’. We are all familiar with the ‘isms’ & ‘ists’ speech and can read into the true message. Since Hilary does not have the competence to run a successful campaign against a fictious sexist, misogynist or white supremacist she needs to continue the narrative and insist dignity and identity are deserved while your hand is supported. Lets put it where the goats can get it –campaigning on oppressive and demeaning messages will not allow you to call the White House home Unless your message is based on Merit, Merit Merit. Just think of all the years of experience Hillary has in public office and she could not pull off a win buy throwing ‘isms’ and ‘ists’ at a man that was considered to have zero chance at winning. It takes a special kind of person or party to continue a message proven to be a failure. With insanity and incoherent messaging running rampant throughout the democratic party the approval rating /popularity levels of Trump continue to gain momentum. This is why we need to pay close attention to messaging from the left. In 2020, democratic challengers (like Hillary in 2016) will campaign on NOT BEING TRUMP and insisting everyone deserves everything. Since this is obviously a tried and true – One And Done – strategy, the approach will now focus on SINCE YOU CAN’T BEAT HIM – IMPEACH HIM. Seriously, this will be the directive of democrats controlling the House. Republicans – we have effective and efficient messaging on our side and we need to remain vigilant, this fight will soon be over. Support the progress made over the last two years, support President Trump. 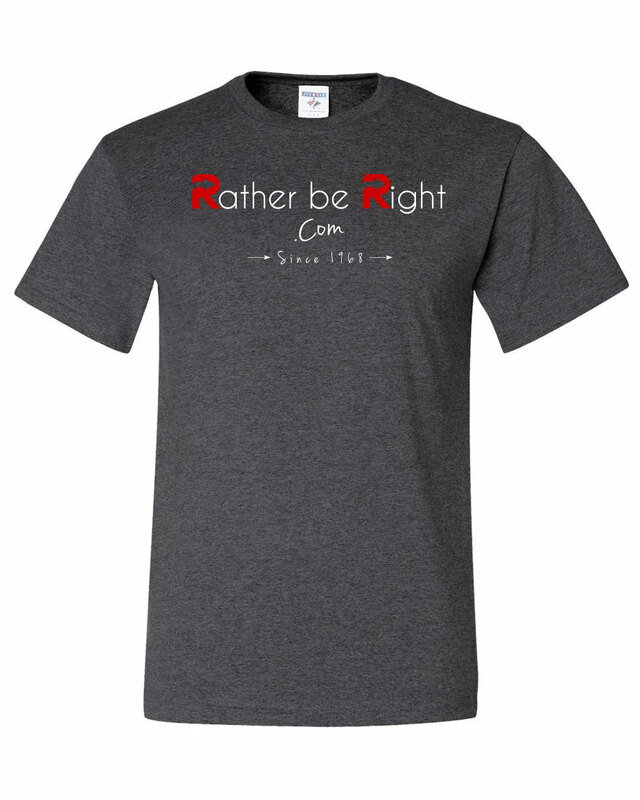 I’d Rather be Right wouldn’t you. Democrats want you to believe they are the party that stands for voter rights and mandates voter suppression / intimidation will not be tolerated. This seems like a very likable position that can do no wrong. Democrats will fight for your right to vote but what happens when someone wants to run for president that the democrats do not approve of? What if someone has viewpoints that challenge democrats? What if someone with persuasive opinions or ideas threaten the insignificant and thoughtless platform of the Democratic Party? Enter Mr. Schultz, former CEO of Starbucks. Now this is a dilemma facing Democrats because they are rightfully concerned of splitting votes and providing our President a path to a second term. In typical democratic fashion they need to address this before too much damage is done. Pull out the democratic play book. Chapter 1 – Page 1 - Paragraph 1 – Sentence 1 – Word 1 – PROTEST!!! That’s right, when Democrats do not get their way they should protest, march and boycott. Boycott, a real favorite in Clintons failed run for the presidency. Did democrats learn anything from Clinton’s pathetic outcome, not really. As a matter of fact, they are picking up the ball just where Hillary dropped it and believe a boycott of a famous coffee company based in Seattle is just what the doctor ordered. The democratic idea to boycott Starbucks until Shultz left the 2020 campaign surfaced. So the motto: everyone should be able to vote but not everyone should be able to run develops true meaning. Democrats have so much contempt for Donald Trump they would abandon recognizing the individual rights of Mr. Schultz and disrespect the entrepreneurial objective of an American company that simply is not currently affiliated with Mr. Schultz. Logic and common sense left the party and in return they are forming a crowded field of candidates offering irrational lack of unity that justifies actions of diminished intellect (for the left wing readers – I mean boycott). Watching the spectacle for the sidelines, we do not want to provide democrats with the one word they are all guilty of; but we can sarcastically give them the definition. They continue to do the same things while expecting different results. While the madness continues, a Trump second term is inevitable. The problems within the democratic party are so drastic, dire and destructive, it will require thought provoking and honest conversations not irrationalism (The Green New Deal) not drastically moving ideology (Socialism) not identity politics (this is to easy – Jusse Smallett) not incompetent behavior (Everything Virginia) not crying about inequality (Is Mr. Schultz equal?) not superficial solutions (Free healthcare, tuition, child care, higher minimum wages and take away guns!) and not lying about wanting to protect our boarders (anti Wall). It is so easy to see why Trump has such tremendous support and this is the answer to Thom Hartman’s burning question on his show today. What is it going to take for Trump supporters to abandon him??? How arrogant and misguided. Do you believe this question could be asked by a liberal talk show host with 20 plus years of experience? It is refreshing to see so much deep seeded incohesive processing within democratic support. Simply put Thom, Trump’s support will only grow as the democratic party resorts to outrageous and extreme views and its candidates share a common thread of today’s media – FAKE! It’s time for a rebuttal that is Right. Lets breakdown the messages that have been generated in the media over the weekend. During a summit with North Korea in Hanoi, President Trump did not generate the desired Nuclear agreement that was sought. President Trump ‘walked away’ from any negotiated deal. Although most agree, walking away and NOT positioning the United States in an increasing dysfunctional situation is strategically impressive, major networks chose the low road and discussed a straight line bias approach of bashing our president. Lets be honest and ask the following questions. What president prior to President Trump met with or personally negotiated any agreement with North Korea that would benefit the US? How many Nuclear tests have commenced during the Trump administration vs previous administrations? What was the last president (prior to President Trump) to have remains or prisoners returned to American soil? North and South Korea marched under a single unified flag at the 2018 Winter Games. Who was the last American President to be considered for the Nobel Piece recognition based on the discussions of peace and denuclearization? Remember, president Trump has only been office for two years and the magnitude of his accomplishments are over showed by a media that has a definite agenda of focusing on our presidents failure. Prior to the NK Summit the media fell over itself with disparaging remarks and questioning Trumps competence. The media led us to believe Trumps preparation was casual, not appropriate and nonchalant, he was going to say something incompetent, did not understand the magnitude of the summit, will pursue vague promises, he had a contentious relationship with NK leadership etc. etc. etc. Polar opposite of our mainstream medias message are the true results. I believe Trump’s relationship with Kim Jong Un (or as Rev. Al Sharpton says it Kim Jong Young) is significantly stronger in two years than Obama’s after eight. Trump is the first sitting American President to met face-to-face with a North Korean leader but not the first to be asked. Previous administrations had (and passed on) the opportunity which makes Trumps two summits truly historic and a bold new approach to diplomacy / denuclearization. You would be challenged to get this message from the mainstream. Todays coverage is adolescent at best, some may say FAKE.